If your lawn appears to have a slimy mold growing in it, the problem may be algae. As it dries, this algae covering becomes a black crust that covers the soil in the affected areas. 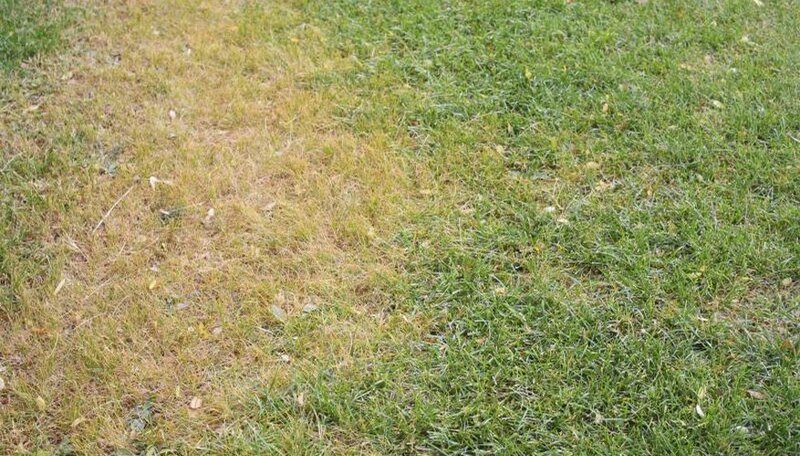 This crust makes it difficult for water to penetrate the soil, potentially damaging your lawn by cutting grass roots off from the water they need to survive. If left untreated, algae can result in brown patches in your lawn as the grass dries out. One potential cause of algae growth in your lawn is compacted soil. When the soil is too compacted, water can't drain effectively and lingers in the top layer of soil; in some cases, it may even pool on top of the soil. Compacted soil also makes it harder for grass roots to penetrate deeply into the soil, resulting in weaker grass that can easily be overgrown by algae. Breaking up the soil, adding sand to it or installing French drains to more effectively drain water will correct water retention due to compacted soil. Using fertilizer and watering the lawn both potentially make the grass grow well and make your lawn look better, but too much of either can create an environment that's primed for algae growth. Test your soil in several areas before fertilizing, adding only enough fertilizer to supply the nutrients your soil lacks. Water the lawn only when it needs it, and carefully monitor and adjust the watering schedule if you use an automatic system. Algae grows best in shade, so increasing light penetration to the affected area can reduce or stop algae growth. Thinning overhanging branches, especially the lower branches of shade trees, will allow more sun on the lawn and will improve airflow over the lawn. If you have areas of deep shade, consider overseeding with a shade-friendly grass, such as St. Augustine grass (Stenotaphrum secundatum), which grows in U.S. Department of Agriculture plant hardiness zones 8 through 10. Few chemical treatments are effective in eliminating algae from your lawn in the long term, though copper sulfate is a notable exception. Applying 3 to 5 ounces of copper sulfate in 3 gallons of water for each 1,000 square feet of lawn is an effective form of algae control. You may need to make more applications if the algae begins to develop again. Wear protective clothing, long pants, long sleeves and goggles when working with copper sulfate and keep pets and children out of the area while you're working with the chemical. Do not use the copper sulfate near ponds or other bodies of water that contain fish or aquatic wildlife. Underlying causes of the algae growth still need to be fixed to fully correct the problem. The conditions that allow algae to grow in your lawn also promote the growth of moss, which can also have a negative effect on your lawn. Treating the underlying causes in the same way that you would treat for algae can get rid of moss that is growing in your lawn. Keep in mind that the moss may turn brown as it dries out and dies, temporarily causing dark spots in your lawn until the grass has a chance to regrow in the area.